16 April 2019 I’ve made it my mission this year to try submitting my stories for publication in a few of the journals, magazines and zines out there. Although I have had a few pieces published online, they are all a result of entering competitions. I felt it was time to do the very grown-up thing of submitting for publication! Following the advice of some wonderful writers I submitted my first piece to Ellipsis Zine and was delighted that they accepted it. 9 April 2019 Last month I was so delighted to have been shortlisted for the Bath Novella-in-Flash award. My novella, At the Bottom of the Stairs, was one I wrote over the last half of 2018 and a few weeks after the shortlist was released I am still pinching myself that I was on it! You can read about the overall winners here. A novella-in-flash is a very short book where each chapter is under 1000 words and contains a little mini-story in its own right, as well as contributing to the overall narrative of the book. 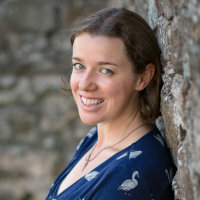 17 January 2019 I am delighted today to be able to bring to you a little interview with author Anna Lickley. Anna’s debut full-length novel, Senseless, was published by Unbound Press this week. Although fiction, Senseless, draws on Anna’s experiences of living wtih disability. Having been diagnosed with the complex genetic illness neurofibromatosis 2 at the age of 16, Anna is now registered deafblind. She is the in-house writer for Can You Hear US CIC, and enjoys writing poetry and short stories as well as novels. 31 December 2018 Happy New Year! This year has been a quiet year of writing for me, although not entirely without success. Three pieces of flash fiction came third in Flash 500, third in the Ruth Rendell Short Story Prize (for which I went to a prize-ceremony in London to hear my story read by an actor!) and highly commended in the TSS Flash Fiction Competition. I have spent the last five months or so doing something I hadn’t planned at all. 1 October 2018 It has been a long time since I wrote about my day-to-day writing. That is in part because the little writing time I have seems wasted on blogging, and it is partly because there has been little to write about. Until recently that is… A year and a half ago I wrote a long post explaining why I was failing to write my second novel. Well, I did carry on - in the more joyful and laid-back manner I wanted - and I loved writing it in a new structure and with different characters etc.